Thank you for your interest in United Way and learning more about how your donation is used. We are committed to complete accountability and transparency, and we welcome the opportunity to share information. Dollars donated locally to United Way of Southeastern Connecticut are invested locally, unless otherwise specified by the donor. United Way of Southeastern Connecticut is an independent non-profit organization, and all decisions are made by our local Board of Directors and volunteers. United Way Worldwide is the international organization dedicated to leading the United Way movement in making a measurable impact in each community. United Way of Southeastern Connecticut pays dues of less than one penny of every dollar contributed, or less than 1% of money raised. The value of benefits received from United Way Worldwide, such as national government relations, free marketing and advertising support, trainings, support to national companies running campaigns, is always far more than is paid in dues and helps keep our local costs down. United Way donations are used to meet critical community needs in the county and invested in long-term solutions to top social problems, including but not limited to quality child care programs, employment training, mental and physical health care needs, services for seniors and those with disabilities, and basic needs including food, fuel, and shelter. 87 cents of every dollar donated to United Way of Southeastern Connecticut supports 70 local services, programs, and initiatives. A vast network of volunteers involved in all aspects of United Way’s operations has kept the overhead at a low 13%, which is consistent with the average overhead of United Ways of similar size throughout the country. This figure compares favorably to the suggested Better Business Bureau's recommendation of up to 35% for nonprofit organizations. In addition, Charity Navigator rates us four stars, the highest rating. We received a rating of 94.64 (out of 100) for Finances and a rating of 100 for Accountability and Transparency. The United Way system has developed comprehensive requirements for completion of audited financial statements. They are intended to create a uniform set of standards for all United Ways to follow in preparing audited financial statements to ensure consistency and transparency on the part of each United Way. The requirements are based on current best practices in our industry as well as generally accepted accounting principles and requirements of the Financial Accounting Standards Board. 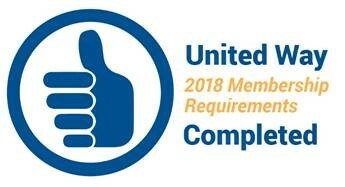 The United Way system has also developed requirements for completion of the IRS Form 990 that clarify various areas of ambiguity and establish a single United Way standard for the 990 where the IRS allows for several different approaches.